The score that Steven Spielberg calls "John Williams's best work for the movies" has been reissued in a two-disc set that lets fans hear more of the glorious music than ever. Even though the Star Wars scores will always be the legendary composer's most recognizable work, it's easy to understand why Spielberg feels that way about Williams's music for E.T. the Extra-Terrestrial. It's arguably Spielberg's greatest film as well, and Williams's delicate, luminous score is integral to its effect. The original soundtrack was an eight-track, 40-minute release that included three film tracks, two expanded versions of film cues, and three presentations of key themes. What it amounts to is less a soundtrack per se than a suite, and it's preserved on the second disc of a new 35th anniversary soundtrack release. In 2002, Geffen issued a 20th anniversary soundtrack that finally made most of Williams's music available as it was heard in the film. Delicate cues like the original Main Title music and music accompanying the alien's cautious explorations of his new neighborhood were restored, and listeners could follow the gradual emergence of themes like the iconic, sweeping melody that accompanies Elliott's flying bicycle. 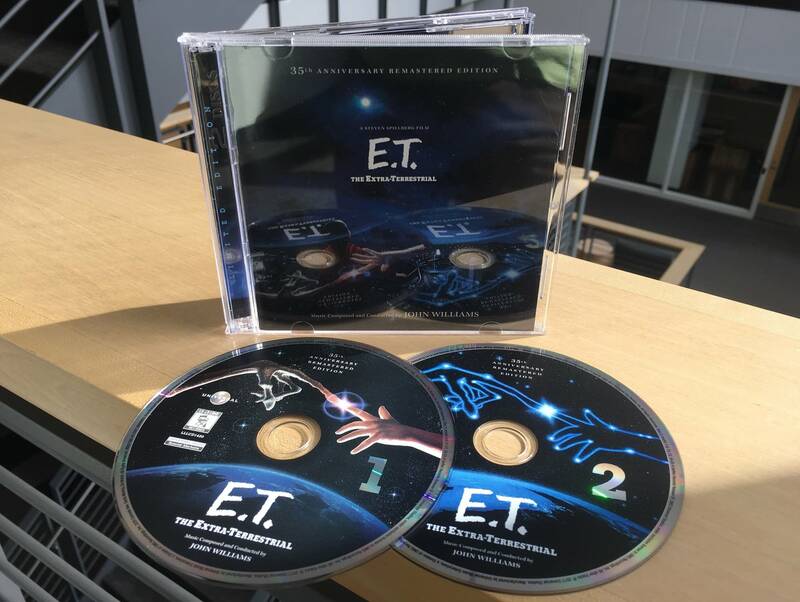 La-La Land Records has just released the ultimate edition of the E.T. soundtrack, a two-disc set timed to the movie's 35th anniversary. The first disc contains the score largely as heard in the 2002 release, but completely remastered from the original tapes and with a couple of additions. One of those is the music for E.T. hiding in the closet, a short but tense scene that was a signature moment in the film, one that gets a laugh in theaters but is handled with poignant yearning by Williams. Also, this reissue restores a cue named "Stay With Me"; that's the music heard in the film, and a similar track heard in that place on the 2002 edition ("E.T. is Dying") is included on the new release's second disc. Disc two includes the 1982 soundtrack, remastered for the first time since its release, as well as 12 never-before-released bonus tracks. The first is actually music that Williams arranged for the Universal Studios "E.T. Adventure" ride, a four-minute experience that must seem much longer when you're on it. Other bonus tracks include alternate versions of cues heard in the film — in some cases, the variation is due to the fact that Williams tried to sync his score to the picture before Spielberg decided it would be better to cut the picture in time with the music's best tempo — plus a couple of genuine curiosities. "The Kiss" is music heard when E.T. 's watching The Quiet Man, buzzed on beer and transmitting his thoughts to Elliott — who duly plants a smack on a classmate. (It interpolates "Isle of Innisfree," a song also used, but differently, in the actual Quiet Man movie.) Then, there's a brief cue called "Levitation," written to accompany the deleted scene where Harrison Ford made a cameo as Elliott's school principal. Liner notes by reissue co-producer Mike Matessino shed new light on Williams's process, and on the music's life beyond the movie. That life has never been better than it is now.